Justin Robinson's adventurous alto saxophone sound is at the center of this powerful quintet session, a tribute to the late bassist and Criss Cross regular Dwayne Burno. Featuring Burno himself on bass -- in one of the last sessions before his untimely death in late december 2013 -- Alana's Fantasy finds Robinson and his esteemed colleagues in peak form, playing standards, originals, music by Jackie McLean, Thelonious Monk and more. 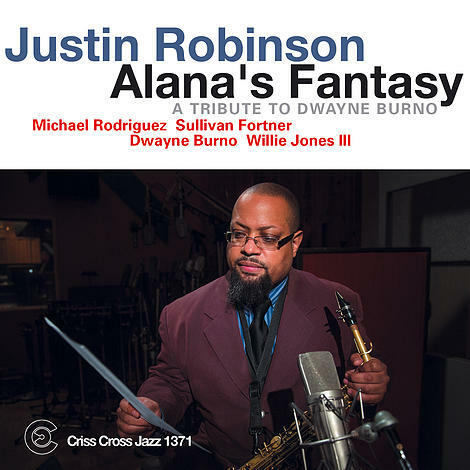 Trumpeter Michael Rodriguez, a noted Criss Cross leader and sideman, joins Robinson in the frontline, while Sullivan Fortner makes his Criss Cross debut, and drummer Willie Jones III his first label appearance since 2008. Steeped in the vernacular of blues, bebop and ballads, Robinson has made signal contributions to the music of Roy Hargrove's quintet and big band, the Dizzy Gillespie All-Star Band and many others. 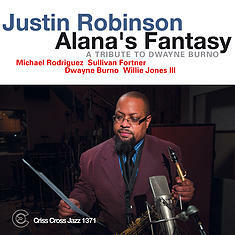 With Alana's Fantasy he raises his profile as a leader, living up to the daunting legacy of the post-bop alto while claiming a voice of his own -- the kind of pursuit that Dwayne Burno exemplified throughout his career.